Beginners Guide to Understanding the Blockchain | The Daily Programmer '+g+"
What is the blockchain? You've seen the word several times on the internet, you kinda know that it's somewhat related to bitcoin. You've heard it used in conjunction with all the latest buzz words - AI, machine learning, IoT... But you probably still don't know what it exactly means. Blockchain is a concept that was introduced by Satoshi Nakamoto in the year 2008. It is basically a secure database design, that holds information related to transactions. Confusing? Let's take the help of an example. A blockchain is just like a public ledger - it keeps a record of all transactions occurring through the blockchain. Bitcoin for example, is a cryptocurrency - a new form of currency that is based on blockchain and is available only in digital form. If you send or receive bitcoins, all the information of the transaction, its timestamp, summary, amount transferred etc. are stored in the blocks of the blockchain. One feature of the blockchain is that all transactions are anonymous and are recorded. You cannot identify people directly using the information from the transactions. Having all the transactions publicly recorded and viewable increases the transparency of this mechanism. One important thing to understand about blockchain is that it is completely decentralized. What this means is that there is no one single entity, organisation or server handling the entire blockchain. It is users like you who volunteered to be a part of blockchain development and are responsible for maintaining the system. These people are called miners. We will talk about miners in a short while. Essentially, blockchain is a chain of blocks. Now what is a block? In simple terms, a block is a distinct entity that consists of records of transactions - think of it as a page in your ledger or accounting books. In a blockchain you'll have several blocks connected to each other. Each block will be linked to the previous block just like a reverse linked list (you'll know the term if you're a programmer, otherwise think of it as a page in a book linked to the previous book with threads). This link is what enables the chain like structure of the blockchain. We talked about miners, let's see what they actually do. Miners are helping in building and maintaining the blockchain. Since there is no one governing entity for the blockchain, it is up to users like you and me to decide to be the governing entity. If we decide to contribute to the blockhchain, we'll be known as miners. How does a miner help? A miner provides resources for maintaining the blockchain. These resources are in the form of their computer's processing power. These computers are called nodes, and they communicate with other such nodes in a manner known as peer-to-peer connection. These nodes are distributed across the globe, so even if one of the nodes goes down - for example, due to a power shutdown in its region or any other cause, the remaining nodes on the P2P (short for peer-to-peer) network which are running will continue to keep the blockchain alive. How exactly do these nodes contribute to the blockchain? All the nodes will keep a copy of the blockchain - all the blocks and their links - with themselves and will regularly sync with the other nodes to ensure that all the nodes have the same copy. Once a new transaction is added, each node verifies the transaction using an algorithm. When the majority of the nodes verify the transaction, it is added in the blocks. Hence, the miners play a useful role in ensuring that the blockchain remains sustainable. Verifying a transaction is key to the mining in blockchain. Only when a transaction is verified by the miner, the miner is rewarded in bitcoins. Seems appealing, doesn't it? Of course, you need to provide people with some incentive otherwise no one will be interested in taking up these huge task of maintaining the blockchain. Here's one more feature of a blockchain - you cannot modify or delete a transaction that has been entered into the blockchain. Once it is in the blockchain, it stays there forever. This is a means to ensure security and transparency, as well as protect from scams. Each of the blocks is secured by means of hashing - a technique that maps a key to an indiscernible value. The information stored in the blocks is converted to this value and stored in that form. You can find the value if you have the information, but you cannot trace back - that is, if you have some hashed values with you, there is no feasible algorithm to return the original information back from those values. This is what makes the blockchain more secure. 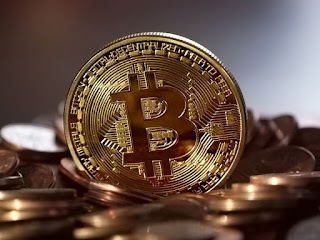 Even though most big companies and businesses do not acknowledge bitcoin as a legitimate currency, mostly because of the lack of trust in this type of new system, and reluctance of governing bodies to authorize or issue regulations, there are many small to medium businesses and startups who are keen understand and leverage these latest trends in technology and in order to attract the young and tech savvy, who have started accepting bitcoins as a means of payment. The concept of blockchain however, is gaining interest from big companies. Though they may not be interested in bitcoins, they are interested in developing applications using the decentralized system model of blockchain. "The bitcoin bubble and it's inevitable crash" forebodes every other headline in news articles these days. You've heard the naysayers of bitcoin as well, who are just waiting gleefully for the bitcoin to be crashed. But how exactly will it crash? What most of these news articles are referring to is the 51% attack that says that if there are more dishonest people in the blockchain, our secure decentralized wall will break down. We've seen how transactions get added to the blockchain - it depends on the agreement between majority (>50%) of the nodes. If however, the majority is somehow compromised, in other terms - controlled by hackers, then they can interfere with how transactions are verified and break down the secure and reliable system of blockchains. Due to the independent nature of blockchain, it is difficult for new users to get security of their assets in the blockchain and hence, most newcomers are wary of investing in bitcoin, despite its amazing performance. So this covers most of the things you need to know about blockchain. Hope this article helps you in getting a general idea of the concept of blockchain and how bitcoins fit into the whole system. 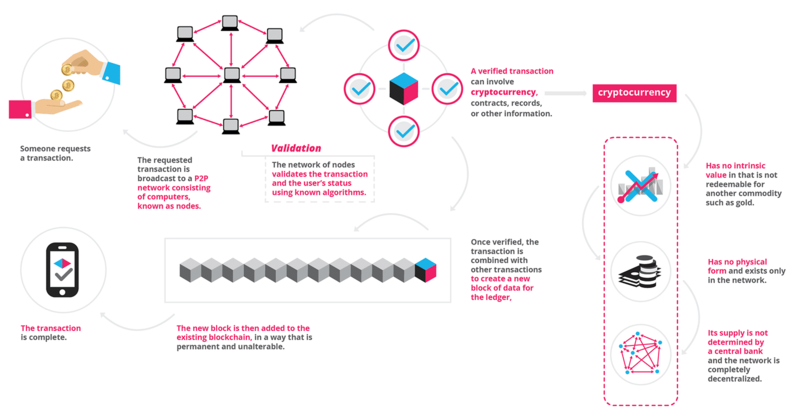 Here's a detailed example of how the blockchain technology works using simple examples. One last piece of information you definitely must know - do you know the worth of 1 bitcoin in terms of United States Dollars? It's $15499.00 as of 22 December 2017. Yup, 1 bitcoin is worth more than $15k. That site has since shut and this site works by conveying a couple of commercials a month.https://howcc.to/ You consent to get those messages by asking for the bitcoins. Reorder your new bitcoin address and enter a telephone number to which you can get a SMS.